Some of the team from the University of Nebraska-Lincoln. 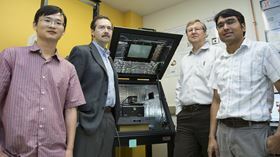 From left: Haidong Lu, postdoctoral researcher; Alexei Gruverman, professor of physics and astronomy; Evgeny Tsymbal, professor of physics and astronomy; and Tula R. Paudel, research assistant professor. Image: Troy Fedderson/University Communications. As reported in a paper in Science, a team of physicists has defied conventional wisdom by inducing stable ferroelectricity in a sheet of strontium titanate only a few nanometers thick. This discovery could open new pathways to developing materials for nanotechnology devices, said Alexei Gruverman, a University of Nebraska-Lincoln (UNL) physics and astronomy professor who worked on the research. It also contradicts the expected behavior of ferroelectric materials, which normally lose stable ferroelectric polarization as they are made thinner. "If you make a strontium titanate film very thin, all of a sudden it becomes ferroelectric at room temperature," explained Gruverman. "If you make it thicker, ferroelectricity disappears. That's very strange, as it goes completely counter to all the common knowledge regarding the thickness effect on ferroelectric properties." Ferroelectricity, which is an electrical analog of ferromagnetism, is characterized by a stable electrical polarization that can be switched (re-oriented) with the application of an electrical field. This quality makes ferroelectric materials useful for an array of electronic applications, such as computer memory chips. However, the tendency of these materials to lose their ferroelectric stability as they become thinner has limited their usefulness in nanoelectronics. Many scientists have been investigating techniques to create ferroelectric materials that can still be useful at nanometer scale dimensions. Strontium titanate, often used as an insulating material in dielectric capacitors, isn't normally ferroelectric at room temperature. It is a perovskite, a family of complex oxide materials with distinctive cubic crystal structures. Perovskites have long been recognized as having a variety of useful physical properties, including superconductivity, ferromagnetism and ferroelectricity. In recent years, they have been studied for potential use in solar cells. The crystals in a perovskite aren't always perfectly formed, though. If one out of every 100 strontium ions is missing from the cube-shaped strontium titanate crystal, it can create polarized nano-sized regions within the crystal. Ordinarily, however, the material's bulk serves to isolate such polar nanoregions in an insulating matrix. But not in the strontium titanate material fabricated by physicists at the University of Wisconsin, together with a team from the University of Wisconsin led by Chang-Beom Eom. This material comprised epitaxial films of strontium titanate spread across a substrate of the same material, no thicker than the size of these polar nanoregions. This structure drastically altered the electrical boundary conditions in the films, forcing the polar nanoregions to interact between themselves and respond in a cooperative manner to the applied electric field. This allowed for the emergence of switchable and stable polarization, which the UNL team observed using piezoresponse force microscopy, a nanoscale testing technique developed by Gruverman. The team also tested the effect with mathematical simulations and electrical measurements, as well as through structural microscopic studies. Gruverman said it is not yet known whether other perovskite materials will exhibit the same qualities. "We don't know if this effect is unique to strontium titanate, but we hope that this approach can be extended to other perovskite dielectrics in which polar nanoregions are controlled by careful engineering of film defect structure," he said. "This may provide a path toward devices with reduced dimension where ferroelectricity is coupled to other properties, such as magnetism." This story is adapted from material from the University of Nebraska-Lincoln, with editorial changes made by Materials Today. The views expressed in this article do not necessarily represent those of Elsevier. Link to original source.